Big sister, Ruya, watches over a half sibling baby brother. Christie Keith writes "Forget all the rhetoric on both sides, and just keep the goal clear in your mind: Reducing the number of dogs and cats who die in California shelters." 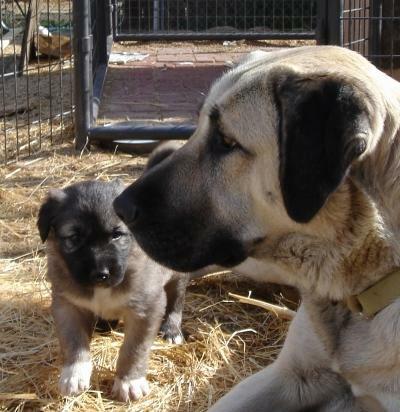 Can the two sides of mandatory spay/neuter find common ground? See the whole article at SFGate. From the very start of the issues involved with AB 1634, I've felt that if more people had a better feel for the complexity of elements involved with reducing the euthanization of pet animals and finding successful "forever homes" -- we'd have more in the way of cooperative and successful teamwork. So many have been saying, "Education doesn't work" and argue that brute strength of law is the only solution. AND then... THEY go on to illustrate by their own arguments, amazing ignorance in the complexities of the equation. Hello? Education? How about starting with up close and personal. Divide and conquer, and punitive legislation are hurtful and counterproductive. Mind opening newsletters. . . Which points out HSUS's dichotomy, for example, spreading fear about feral cats. He, in another document, writes (p6) also about how HSUS opposed King County in Wa State when they were adopting a real No-Kill philosophy. Go on a tour of shelters here. Shelter accountability needs to be addressed. Nathan Winograd is doing a lot to educate and promote working together. Spend some time checking out his site, subscribe to the free e-newsletter, consider becoming a No Kill Advocate member and get the hard copy version of No Kill Sheltering Magazine. Semavi Nipper at left in a 1992 photo. Many Anatolians and their progeny will NOT qualify for an exemption under AB 1634 as currently suspended until 2008. The so called "exemptions" are little more than misleading hocus-pocus and bluffery designed to appease the unknowing. Past President of California Veterinary Medical Association (CVMA) and animal advocate, writes from experience of twenty five years in trying to find solutions to the problems of animal relinquishment and euthanasia. Go here to read the TESTIMONY OF JOHN HAMIL, DVM on seven false premises of AB 1634. At Sandiegodog blog, a piece by Laura Finco fleshes some some of it out as she writes about a neighbor. Meanwhile, in L.A. stuff like this goes on under General Manager Ed Boks - shown here to be manipulating his shelter statistics while under scrutiny. Mandatory spay and neuter is a NON-solution to relinquishment, abandonment, lack of responsibility and the issues of unowned strays. Deliberately choosing to ignore the above complex problems and lack of accountability in most animal shelters, while shifting "the blame" flaunts ignorance, denial in perception and problem solving ability. Humans and long term relationships will always have dynamics. Consider marriage, 50% of which are said to end in divorce - The remaining 50% cannot even be considered uniformly successful. Who knows how many 'stick together' despite abusive or other malignant activity? Relationship failures are complex. Why should it be no surprise that not every pet which starts out with a home has a permanent one. Pets being relinquished or left to run free are not caused by an "over population" problem but something more far more complex. - - Is it People Overpopulation? Homelessness, world hunger, pollution, crime, wars, disease and even "pet overpopulation" can all be solved by stopping the source of all these problems. Using the same principles of logic, every two year old, pre-adolescent child in California must be castrated. I'd hate to see these geniuses try to work out who gets "exemptions". My whole point is that "stop the flow" does NOT address the problems. Profiling a population, even a pet owning one as they do is draconian, ignorant and juvenile. The Associated Press - GAINESVILLE, Ga.
You can't say the three burglary suspects chased down by police dogs weren't warned: Signs identified the scene of the alleged crime as a police dog training facility. "It was posted everywhere, 'K-9 training facility,'" said Hall County Sheriff's Sgt. Kiley Sargent. The dog handlers showed up at 4 p.m. Wednesday up for a training session inside the abandoned Lakeshore Heights Nursing Home when they discovered two men and a woman dismantling the building's copper pipes and wiring, Sargent said. When the officers arrived, the three dropped their tools and ran. "For anyone to try to run from a whole unit of canines, it's just a no-win situation," Sargent said. The woman, Pamela Puckett, 37, quickly surrendered. One man, Paul Perry, 39, got a dog bite just below the buttocks before he was arrested, authorities said. The second man, Marc Black, 18, was tracked to a trash bin behind a nearby convenience store. Perry, a Gainesville resident, and Puckett and Black, who live in Braselton, were each charged with burglary, Sargent said. Perry and Black also face misdemeanor obstruction charges. Perry was treated at Northeast Georgia Medical Center for a superficial bite wound, Sargent said. Police don't know whether the three didn't see the dog training signs or just ignored them. "It's not like it was a secret," Sargent said. "I guess someone who is that determined to steal something might not pay attention." That's hilarious. It reminds me of something I saw on TV as the police have busted a crack house and are carrying away evidence. One guy comes up and wants to buy drugs from one of the policemen. One guy comes up and wants to buy drugs from one of the policemen. Ahead of high-level visits by U.S. and European officials, China moved to sharpen its product safety image Friday, shutting down a chemical plant linked to dozens of deaths in Panama from tainted medicine and closing two companies tied to pet deaths in North America. Inspectors work in a food safety inspection center in Beijing, China. The measures come as Beijing struggles to reassure global customers that it takes food and drug safety seriously amid concerns over chemicals and toxins that have been found in its products. This guy on the left is too cute. 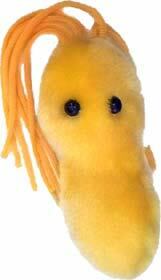 Know anyone that would like to have a pet Ulcer bacterium? Now they can be the person with everything and thank you for this thoughtful gift of a giant Helicobacter pylori. (site says toys are 5 to 7 inches long). That's a sizeable ulcer bug! Your favorite hypochondriac or chosen victim (hopefully one with a great sense of humor) might also enjoy having Athlete's Foot, Mange, The Clap, a Pox (way cute!) and Heartworm too! Spread the joy with the kind of gifts that have been known for their ability to keep on giving! ;) The common cold also comes as a soap dispenser. The giant mosquito, the fly and the little Martian may appease those with different tastes. It takes all kinds! Check out GIANT Microbes. Thanks to Mark for the alert! "Support bacteria - they're the only culture some people have." 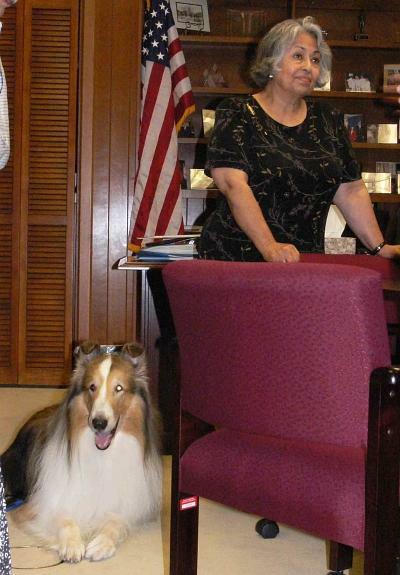 LASSIE GOES TO THE STATE CAPITOL - Brings Legislators to their knees! Lassie arrived late afternoon at the State Capitol and went right to the top. No, not to the Governator, but to Senator Gloria Negrete McLeod, Chairwoman of the Local Government Committee that will hear bill AB 1634 on Wednesday morning. Nearly 1000 Californians are expected to show up for a hearing in a room that only holds 60 people. Sounds like a morning on a Los Angeles freeway! 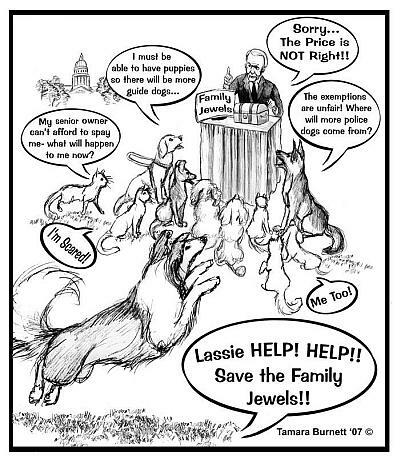 Lassie then went calling on Legislators seeking their opposition to the bill that many are calling "the Pet Extinction Act". Lassie is really Laddie, a 7 year old massive specimen of a collie, and certainly a fine actor since he has been cast as a female dog! This is a continuation of the tradition to use a male to represent the beloved Lassie, American icon of family values and courage. And the answer is yes to the question to whether Laddie is an intact male. 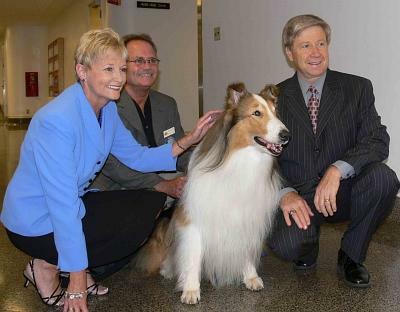 Her owner, world famous dog trainer, Bob Weatherwax, heir to 65 years of Lassie lore and legend, plans to breed Laddie in the near future to insure another generation of the unique collies. The Weatherwax collies are not registered since they all carry the trait of a large white blaze on the head that collies registered with the American Kennel Club do not bear. Senators and aides alike agreed that this marking was one of Laddie's best features! This unique line of collies would not be eligible for exemptions under the complex mandates of AB 1634. Accompanying Lassie and Weatherwax was Jon Provost who played "Timmy" on one of the longest running shows in television history, over 20 years! Mr. Provost charmed all with his timeless boyish good looks as he spoke eloquently not only for Lassie but also all the mutts of California who are more often used for canine assistance dogs than purebreds due to cost and availablity. Mr. Provost is a honorary member on the Board of Canine Companions for Independence. Laddie is also trained and certified as a service dog. 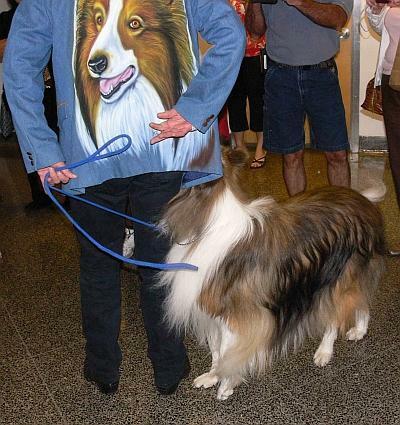 The halls at the Capitol thronged with admirers and fans as Lassie brought them all to their knees for close-up photos snapped with the world's most famous dog that has been a favorite of Hollywood and one of California's best known icons. It remains to be seen if even our beloved Lassie will fall victim to this far over-reaching leislation. In Bob Weatherwax's words, "It's like casting your net for tuna, and then pulling in a bunch of dolphins." We agree, it's just not right -- for California. Let's hope this ends as all the episodes in the past, with Lassie coming to the rescue! WE DID IT! AB1654 has been euthanized. But don't get too complacent - PETA will resurrect it again in some other guise. Thanks to everyone who wrote letters, made phone calls and jammed faxes to defeat this. I kind of feel sorry for Bob Barker. He is reduced to a mindless sound bite after so many years. I'm sure he has no idea of the reality of the bill. I hope I never get that old. Lobbying efforts to fight this draconian bill have been exhausting but the efforts have been very positive. People are learning that there is a need to spay and neuter! People are also learning that the pet world is very complex and profiling is dangerous here, as it can be in other areas of concern. Mancuso herself for one, has LAUGHED, and said that extermination of mixed breed pets is not possible. Because there will be more, they keep on coming. TOUCHE! YES, Judie, we all agree this bill will not accomplish the proposed “INTENT” of the bill. You are too proud to admit it. 1. This bill ENDORSES commercial producers with the broadest and complete exemptions. Commercial breeders are for profit, they do not waste time and money on health testing. They do not follow up on their placements which may well be brokered just about anywhere. 2. Since 27 June, this bill actually mandates the breeding of immature and untested dogs because their one year ticket cannot be renewed til the dogs are old enough to have any kind of offical health test. 3. The bill does not grandfather in many owners who will NOT be able to dole out the cash. Elderly, disabled, young couples, singles, poor folk of every kind, hundreds of rescuers who are working out of their pockets and homes. Where are these animals going to go? 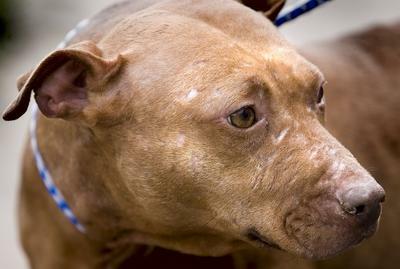 Will pets will be torn from their settled homes and euthanized if the owner doesn’t have the means? 4. Every different jurisdiction can have a different way to define many of the rules. It is a Tower of Babel with local jurisdictions being given total control. 5. NO FIT. The bill heavily profiles all owners and all breeders alike and therefore has numerous NO FIT and illogical assumptions. The majority of problems in the bill are right here. This bill is horrendously guilty of profiling and no fit. It will increase the numbers of animals killed. It does NOTHING to promote ethical breeding nor healthy pets. The principle designers of this bill do not even own pets. Assorted Distractions- Explosions, Computer Cooling and the Best Springfield! Mineral Oil Submersion Cooling for a computer! Watch the movie to the end and check out the bubbles! While I'm not much of a TV watcher nor a huge fan of The Simpsons I have to admit I've gotten more than a few laughs from the sharp wit of the story writers who have given a sprinkling of just about every kind of humor in the show. General kookiness, sneaky bits of decidedly (nearly innocent) adult humor and political commentary sometime has me (sometimes almost disgusted yet) transfixed for the next lightning speed quip that one could almost miss. Thank goodness for closed captions! Go here and choose the best Springfield. What else can I say? Love horses? Love photography? Country life? Mischievous humor? Calf nuts? Vignettes of life with kids? If you've got something of a rural background, you can often get a kick out of the comments section below each entry alone. :) The photo captioning contests are often hilarious and feature unpredictable prizes for the winning captions. Okay, I'm starting to sound like an advertisement. Anyway, as you can see, Ree's blog is a favorite. Confessions of a Pioneer Woman - Go see what Ree is up to! and what she's cooking! I want a new computer, kiddo! Mineral spirits, eh? I don't think I'll use it on my computer yet. -the bill has now had 8 edits. Each edit reveals yet another, and then yet another problem that will need yet another go to get (almost) fixed. Each new layer makes the bill dizzier, and dizzier, defeating whatever good intent may have been fantasized. Great News - The CVMA has gone from support to neutral on AB 1634. Perhaps now there is a little more awareness of the complexity of issues in the scope of our cat and dog influenced world. Maybe the policy makers have learned that generic policy that mandates and profiles every breed of dog and every breeder and owner of cats and dogs exactly the same way, is just bad policy -- the main thing they still don't admit is that the real sources of the problem are not being addressed or remain under the radar. I know dogs better than cats, so I'll be speaking mostly from that perspective again. 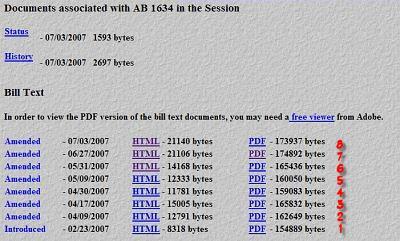 Many of the AB 1634 supporters haven't even read the bill. With thousands of people as trusting as they are, somehow believing this is only about stopping animals from being euthanized in shelters. See food for thought! Would you believe, it's taken several rewrites but finally the "Ugly American" Levine and his equally dysfunctional animal policy advisors finally expanded the bill after repeatedly being told that the two major American dog show registries are not legitimate registries for hundreds of breeds and their varieties from around the world (there are well over four hundred distinct breeds in the world). Limited populations of these varieties in California would have been decimated because they had no "legitimate registry". This unfunded mandate had decreed that they must all undergo the knife. You don't even have to go to international breed books to find some beloved dog breeds that would have been affected. Targeted by the original bill, I've noted that in many forums in previous months and now... many self described pet or dog loving persons who present themselves as knowledgeable about dogs/breeds totally forgot (or actually never knew, even when they owned one!) that one of our country's favorite Made in America breeds, the Australian Shepherd (also called Aussie) has thousands of dogs registered with its own parent club, Australian Shepherd Club of America (ASCA), and not with AKC nor with the UKC. Many more breeds or individual dog examples exist which are not AKC or UKC registered. 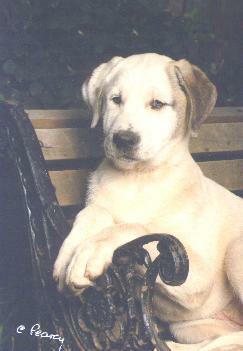 Many individual working breeds from police dogs, to native hunting and regional bully breeds, to varieties of the Parson/Russell Terrier types, to farm dogs such as livestock guardians used in herd protection & wildlife conservation, and hard working herding breeds are among many dogs that are not registered in a "legitimate" registry. Some are new imports which have been selected for contribution to genetic diversity. I have involvement with a breed that cannot always be registered until various requirements are met to verify the quality of the animal and these requirements often cannot be met in a puppy. I know of many other dog enthusiasts who can reel off names and recognize many rare breeds on sight. These people knew that the breeds and the livelihoods of their owners who depended on them could be jeopardized. People who work in rescue, and Animal Control Officers that are not trained in breed matters, when shown a picture, they see these dogs as collie or pitbull or mastiff or shepherd crosses or heinz's goodness knows what else. Go figure. Many shelter workers only know a handful of breeds and and often misidentify the ones they think they know! The same people who can't identify breeds want to make our animal laws and some even want to tell us which breeds are dangerous. Levine, Mancuso, the AB 1634 supporters don't know much about our country's dogs, the clubs, the pet industries, the sports, the people that own the dogs and in their haughty ignorance and disdain of pet people, they have "profiled" all of them. You can't miss this on many of the interviews or emails that come from Mancuso. Quick, the Mancuso Mantra!! "It's all about Money!" Gah, listen to the woman go on about how it's all about profit and that breeders are not reporting their income! And the parrots! My goodness she has lots of mindless little parakeets uttering the same commentary, just about everywhere. Little capuchin monkeys turning a crank and just blurbing whatever they are told. I love original dialog that shows distinct interest in a subject and pursuit of knowledge. I seek that sort of company. But when it comes to issues like this, I am so disappointed in all the little monkeys and parakeets. Ethical breeders, reputable breeders, they are not in the majority. The bulk of those who are law abiding, income reporting, pet loving and responsible breeders who ARE fighting this bill -- are not covered by the first so-called "exemption" (they are not DEALERS who ARE required to report income) nor do the other wonky exemptions apply! Many people who have never raised a dog for show or trained for any of the (alleged) "exempt" working purposes haven't walked the walk yet they too are eager to profile all to a lowest common denominator. Come on, point to a 4-6 month old puppy and tell me you can 100% guarantee the dog won't be nervous, gun-shy, too outgoing, lack drive, lack working ethic, have hip dysplasia, develop a serious malocclusion, cardiomyopathy or other health problem before actually passing testing to do the work required. Come on Newbies, you write the law, let's see you do it. Profiling again. But for SHAME! Mancuso and Levine have sneakily sold AB 1634 supporters on being endorsers of commercial and bulk producers of animals. USDA producers do not raise pets in a house, surrounded by toys and children nor underfoot watching TV from the couch. The animals are raised in cages or runs with hard surfaces that USDA inspectors believe can be disinfected. Buildings housing the animals must not have furniture in them... etc. Most all police dogs and show dogs are raised as pets. They sometimes sleep on carpets, on beds and couches. These facilities would not pass USDA inspection. What is required to pass these dealer requirements? AB 1634 supporters want producer type facilities to raise our future pets. Somehow, this is not how responsible owners should be taught how to choose a good source for a pet. Why are some of those cage raised little dogs so hard to housebreak? When they are, do they get relinquished to the shelter? 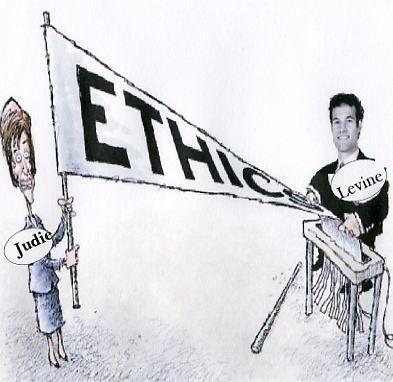 Levine and his advisors have, with the rewrite of the bill of June 27, have built in even more problems. A permit is mentioned that can only be applied once to a dog for one year... and cannot be renewed. Accidents happen on farms and working situations and dogs get killed. After that litter is born, it's scapel time for the parents. The permit cannot be renewed under any circumstances after that one year. What if during the year the dog is run over by a tractor and what if the puppy that is kept turns out to have issues making it unsuitable for the work required? What is the farmer to do then? His carefully selected working stock has been selectively destroyed by the state mandate by reducing genetically available options of maintaining tested stock. In my breed, the dog is immature when this "one year only" clause is in effect. Breeding an immature dog without having the results of adult tests for hip dysplasia and other important factors, then forcing the parent dogs to be neutered means that the government endorses breeding immature animals that have not been tested for breeding quality. AB1634 Supporters are also in favor of the problems in red. They WANT this. They are voting for it. AB 1634 supporters. Look at the bill with comprehension before you endorse. Hope everyone has or had a Happy Fourth! Love the cartoon. I should probably be blogging this, but you are doing a totally masterful job. Be assured that my group is calling and calling. Without hysteria although it is hard when dealing with stupidity.